Eight university teams will be battling it out in the Audi Autonomous Driving Cup 2018 from November 12 to 14 to present the best autonomous driving car. For the first time, the participants have access to digital HD map material of the entire course. The museum mobile in Audi Forum Ingolstadt will now be hosting the competition for young talents for the fourth time. Small, but with the technology of their big counterparts: This description applies to every single blue Audi Q2 negotiating the course. Autonomous model cars on a scale of 1:8 that drive using intelligence are the center of attention in the Audi Autonomous Driving Cup. The international university competition is aimed predominantly at students from areas of information technology such as robotics, data science, software architecture and artificial intelligence (AI). The university teams have prepared the high-tech model cars themselves. 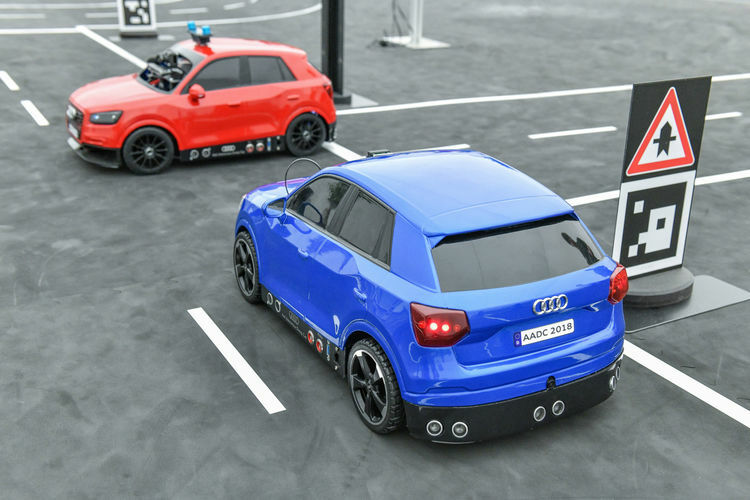 Following the pattern of previous years, these have to drive round the course autonomously avoiding obstacles, correctly negotiating junctions with crossing traffic, recognizing road signs or following a preceding car at an appropriate distance. To reflect technological development, the scenarios for the competition are adapted and enhanced each year. A scenario such as the following is supplied by the “Automated Driving” area: An emergency vehicle that has to be identified using machine learning suddenly appears on the route. Images from the front camera and recordings from the audio microphone are captured and evaluated to shed light on the prevailing traffic situation. If for example the emergency vehicle is approaching head on with its lights flashing and siren sounding, the test car needs to pull over; at a junction, it must always give way. Like the Audi production models, the model cars in the Audi Autonomous Driving Cup are getting more intelligent by the year. Self-learning algorithms help to solve tricky traffic situations swiftly. For the first time the course now features a second road level, accessible via a ramp. Because the sensors on board the cars function optimally, the ramp is interpreted as a regular driving lane that can be used in the normal way, not as an obstacle. The car does this by evaluating the information from the laser scanner and front camera, and assessing the results. “It’s very important to us that the students not only program using the software we provide, but also use innovative technologies such as machine learning,” explained Dr. Peter Steiner, Managing Director of Audi Electronics Venture GmbH, emphasizing the jury’s rigorous expectations. The high-tech model cars are equipped with front camera, reversing camera, laser scanner and ultrasound sensors. The sensor data is merged to provide a precise picture of the surroundings. The sensor data fusion in the model cars is comparable to that in the central driver assistance controller (zFAS) in the production models. A nine-axis acceleration sensor registers changes of direction and sends this information in real time to the central on-board computer with high-speed quad-core processor. A standard software tool that is also used in the development of production automobiles serves as the development platform: the “Automotive Data and Time Triggered Framework,” or ADTF for short. The vehicle positioning uses map material that has been optimized by experts from the navigation specialist HERE. With the help of optical markers along the route, the cars can repeatedly recalibrate their calculated position. Ten nominated university teams – including from the UK, Italy and Austria – were supplied with the basic software and two model cars at a launch event in June 2018. At the test event in October 2018, five teams with identical model cars supplied by their departments also took part. The team with the most points across all three disciplines will receive EUR 10,000 in prize money, the second-placed team EUR 5,000 and the third-placed EUR 1,000. The Audi Autonomous Driving Cup also gives the participants an opportunity to establish initial contact with Audi as a potential employer. During the test event in October, the company invited participants to a “speed dating” event – with experts from Audi and Autonomous Intelligent Driving GmbH (AID), which develops fully self-driving vehicles for the urban areas. The students were able to find out about openings such as internships and doctoral or trainee programs. The two-year Specialist Trainee Program, for instance, prepares trainees intensively for their eventual target function. It enables the specialist trainees to acquire vital expertise in the brand’s future fields of activity by rotating through the areas involved. Audi Electronics Venture GmbH (AEV), a fully owned Audi subsidiary, is staging the Audi Autonomous Driving Cup for already the fourth time. AEV identifies innovative technologies worldwide, participates in startups and cooperates with companies from other industries. It acts as an innovation driver and think tank for new functions and software in the field of electronics development, with the focus on AI, swarm data, end-to-end architecture and smart city. Visitors are cordially invited to watch the public final live at the Audi Forum on November 14, 2018, starting at 8:30 a.m. Experts will be on hand to talk to representatives of the media.